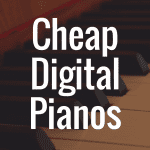 Digital Piano Reviews and News. You are here: Home / Roland Digital Pianos / Roland RP-102 review: A High Quality, Beginner Piano? Roland RP-102 review: A High Quality, Beginner Piano? 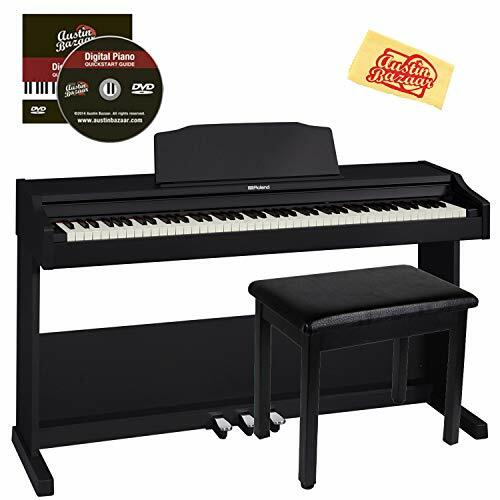 I believe that when you’re looking for a brand new digital piano, especially one you consider will be an ideal digital piano for beginners, there are a handful of things that you’re really going to want. You’ll want a digital piano that feels great to the touch—a piano that has keys that feel like a traditional piano. You’ll want a digital piano that is a great instrument when it comes to learning—something that provides you with key features or functionality to help you improve your piano playing skill. In this Roland RP-102 review, we’re going to help you figure out if this piano meets the important criteria listed above so that you can truly determine if it’s worth your money. And, to better help you, please take a look at the guide below, which will allow you to directly compare the Roland RP-102 to other popular digital pianos on the market. The Roland RP-102, like many other Roland digital pianos, features SuperNATURAL piano sound technology. What you’ll hear when playing the keys is a sound that is rich and full, bringing music to life in a way the feels vivid to the ears. And that’s a pretty impressive feat, because the Roland RP-102 clocks in at approximately $1,000. 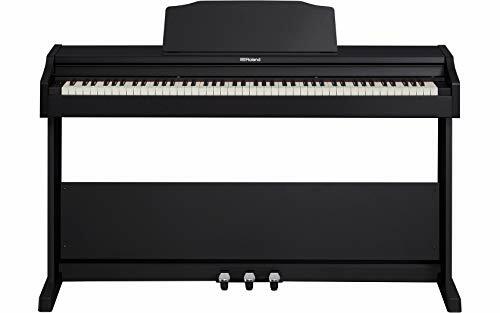 While that price is nothing to sneeze at, it’s certainly less expensive than higher end Clavinova digital pianos made by Yamaha, which some like to compare the RP-102 against. At the same time, it comes in priced about the same as the popular Casio PX-870. In terms of the keybed in the RP-102, there’s a good chance you’ll be just as impressed. The keys feature weighted and graded hammer action with Escapement, which means the keys do their best to replicate the feel of wooden keys on a traditional piano that are hit by real hammers. At the same time, the fact that the keys are graded means you’ll notice the keys feel progressively heavier on the lower end and progressively lighter on the higher end of the keyboard. On top of that, the keys have an Ivory feel to them, which means they’re going to feel a bit grippy to the touch. If you’re not used to this, it might take a brief minute to adjust to it. But, the benefit of it is that, as you begin to not only play the piano for longer periods of time but also play more complex musical pieces, any perspiration that occurs on your hands will be less likely to cause your fingers from slipping on the keys while you’re playing. Speaking of complex musical pieces, I think now is as good a time as any to mention the fact that the Roland RP-102 features a maximum polyphony count of 128 notes. If you’re not familiar with how much polyphony you need to play the piano, well, the truth is that there’s no clear cut answer. It depends on what you’re playing. What I can say, though, is that generally speaking, the higher polyphony you get in your piano, the better off you’ll be in the long run. And that’s because, when it comes to polyphony, it’s all about how many notes you can play at once. The higher the polyphony count, the more notes you can theoretically play at once. A lesser polyphony count means your notes are decaying or disappearing faster, which ultimately removes the “body” or the richness of the piece you’re playing. A lower polyphony count—again, depending on what you’re playing—might cause your musical masterpiece to sound a bit flat. 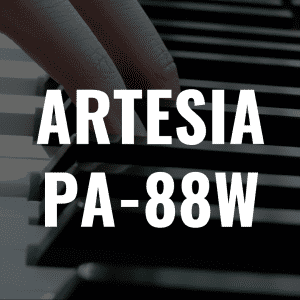 A lot of people tend to like a piano that features 192 or 256 notes of polyphony. With that said, 128 notes is more the adequate for a lot of the pieces people will be playing. And as a result, you’ll feel confident knowing that, as you progress in your attempt to master the piano, that the RP-102 will be able to mature alongside you thanks to the fairly robust built in maximum polyphony. In terms of sounds—the RP-102 doesn’t come with a ton of them. Here, you get four piano voices, as well as 11 additional voices—such as strings, flutes, etc. The more exciting feature here is probably the songs. The RP-102 comes with over 200 built in songs—everything from traditional or classic songs to practice etudes from the likes of Hanon. I mentioned before that this is a very nice piano for beginners, and that’s probably well illustrated by the Twin Piano mode. Here, you can split your 88-note keyboard right down the middle—making it, essentially, a two 44-note instrument. When you do this, your good friend or even your piano teacher can sit right down next to you, and you can practice or duet together, as each split keyboard will come with its very own middle C.
And for the nights when you’re practicing late and you don’t want to disturb anyone, you can take comfort in knowing that this is a piano where you can plug in headphones and not have to worry about waking up your family member or roommate. The only negative with this piano, at least in terms of sound, might be the speakers. While this piano, like many others in its class, comes with two speakers, the amplification is only 6 watts. 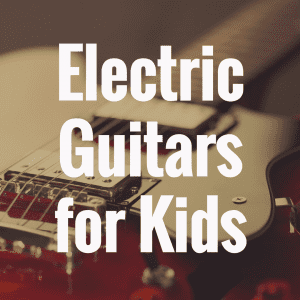 So, depending on what you’re playing, or just in how powerful you ultimately want your sound to be, you might feel that this doesn’t meet your ideal standards. Now when it came to using a digital piano like the Yamaha P-125, I was a big fan of the interactivity of the Smart Pianist app, as it had really enjoyable learning features like Chord Chart. I think that, when you use the Piano Partner 2 app with the Roland RP-102, you get very similar interactivity which, overall, enhances the experience of playing the digital piano. So, let’s first cover a few basics. The Piano Partner 2 app is an application that you can download onto iOS or Android devices. So, you’ll be able to get it working on both Apple and Android phones, as well as devices like the Apple’s iPad or Samsung’s Galaxy tablets. The first thing I like, before we even dive into the cool features that work with the RP-102, about this app is that it essentially serves as one big LCD screen. Many digital pianos don’t come with an LCD screen built into the front of the instrument, so it’s an incredible feeling to just connect your phone or tablet to the Piano Partner 2 app via bluetooth (or via a wired USB cable) and all the sudden have essentially full control over the piano through your mobile device. Now when it comes to how this app interacts with the RP-102, there’s a lot to like here. You’ll have full access to the RP-102’s built in songs—so if you want to switch from electric piano to strings, you can do this by just clicking a button on your iPad or Android phone, rather than having to click on buttons or knobs on the piano itself. You also get a feature called DigiScore Lite. Now, as I mentioned before, you get over 200 on-board songs with the RP-102. And so, this particular feature is very helpful when it comes to playing these songs. What DigiScore Lite does is it displays the music notation for the songs built into the RP-102. On top of that, you’ll notice that your digital sheet music pages on your mobile device get turned automatically as the song continues to play through the RP-102’s speakers. The app will also allow you control for how you want to learn the song. This means you’ll be able to adjust the tempo or repeat certain sections of the song to ensure you get as many repetitions as needed to master the song. Now these features would be pretty cool in and of themselves, but there’s more. The Piano Partner 2 app also provides you with a Rhythm function, which will help you hone your sense of timing when you’re playing different styles of music. For those that are all about playing the piano by ear—there’s a function in this app for you too. The Flash Cards function helps you develop that keen ear for music, and it’ll also sharpen your note-reading skills too. The way this is done is through the Flash Card function, turning ear training and music reading into games. The way it works is quite simple: the pianist (you) will be challenged to play a note that’s shown inside of the Piano Partner 2 application. In other cases, you’ll hear the note emitting from the piano’s speakers. Awards are doled out depending on your success and the function has three difficulty levels, just in case you want a bigger challenge. On top of that, the Piano Partner 2 app comes with a record function to record all of your musical masterpieces. There’s even a Diary section, which will allow you to transcribe your daily practice routines and even share them on social media accounts like Twitter. Now while the RP-102 comes in at about $1,000, the YDP-163 costs a bit more (about $1,500). But ultimately, is it worth the price? Well, the YDP-163 comes with Graded Hammer 3 (GH3) action, which is a hammer action that’s an upgrade over both the GHS or Graded Hammer Standard and GH or Graded Hammer. Being a more expensive digital piano, it’s really no surprise that the YDP-163 comes with 192 notes of polyphony. That’s a definite increase over the RP-102, which only has 128. With that said, unless you’re expecting to play incredibly complex pieces of music (which, of course, is certainly possible), my guess is you’d feel pretty content with the 128 that is features in the RP-102. Size isn’t too big of a factor here either. The YDP-163 clocks in at just over 92 lbs, while the RP-102 is a tad bit lighter at 83 lbs. Either way, once these pianos are set up, you’re not going want to have to move them again for a long time. 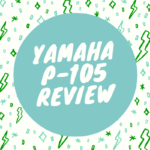 You can read our review of the Yamaha YDP-163 right here. Let’s also quickly take a moment to compare the Roland RP-102 to the Roland FP-30, especially because these pianos have quite a lot in common. Now both of these digital pianos have the same amount of polyphony, and both utilize Roland’s SuperNATURAL piano sound technology. They also both have bluetooth functionality built inside the instrument. 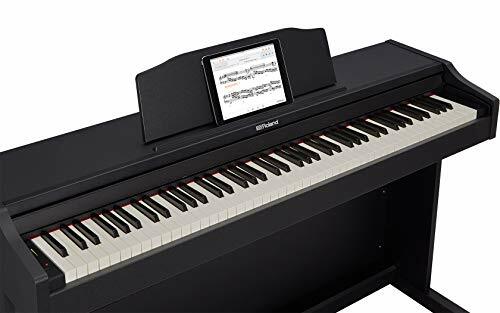 The Roland FP30 is a couple hundred dollars cheaper than the RP-102, and it’s a portable digital piano rather than a piano that comes built inside an attractive furniture style cabinet. So really, what’s the difference? Well, a couple things that are notable, depending on your needs. First, the RP-102 has over 200 built in songs. The FP-30 only has thirty. So, if that’s something that’s important to you, be aware of this pretty stark difference. But it’s not all roses for the RP-102 here, however. Despite both digital pianos having two speakers, the Roland FP30 actually has the better, more powerful amplification (11 watts) over the RP-102 (6 watts). So, despite the piano being portable, featuring less songs, and costing less money, it’s more powerful in the sound department. Again, this might not matter to you depending on what you plan to use the RP-102 for, or the space you plan to play your music. But, it is certainly worth nothing. You can read our review of the Roland FP30 right here. In the end, no digital piano is perfect. But, for about $1,000, the RP-102 provides you with a great instrument that visually looks quite beautiful in your home thanks to its furniture style aesthetic. It comes with enough voices and songs to keep you busy, and its ability to work well with the Piano Partner 2 app means those that are beginners will likely have more fun and effective practice sessions. And when you’re playing the piano, you no doubt want to enjoy yourself while doing it—especially if you’re learning. 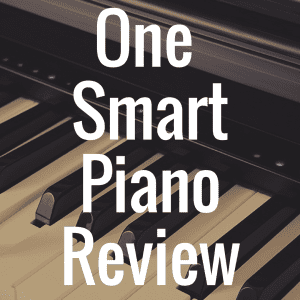 If you enjoyed this article, we’d love for you to “like” our Digital Piano Review Guide Facebook page! Kawai ES8 vs Roland FP90: Which is Better? 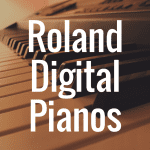 What’s the Best Roland Digital Piano with Weighted Keys? What’s the Best Yamaha Digital Piano with Weighted Keys? What’s the Best Upright Digital Piano Under $1,000? What are the Best Digital Piano Brands?